Which campaigns you are going to focus on in the coming 12 months? What milestones do you have to hit? What new initiatives will you start next year? Maybe you are planning a Growth-Driven Website Redesign or a new product launch. Maybe your CEO wants you to focus on lead generation or implement a chat bot-driven conversation strategy. Or you are planning to write a massively helpful pillar page that will draw in new visitors. Whatever your goals are, you will need the budget for it. However, since more and more CMOs and marketing directors will have to prove a return-on-investment to show that they spend their marketing budget wisely, blowing it on a random paid search campaign is just a waste of money. And you need to make sure you have actually spent this year's budget or you risk losing some next year. Simple! You invest it in something that will give you a head-start! Depending on how much money you have to spend and what your goals are for the next year, there are many things you can do — for example, you could optimize your top performing blog posts for lead generation and search engine optimization, you could design an infographic, or test new call-to-actions for your website. For more ideas, check out this blog post by HubSpot for even more possible end of year action items. They must show a significant return on investment. They must give you a significant head-start for achieving your goals next year. They must be executable on a short notice. How about a new look for the New Year? Redesigning your blog is a great way to spend some left-over budget quickly — with big payback. A blog redesign is essentially applying a new template to your blog posts which can be done quite easily in Content Management Platforms like HubSpot and WordPress. While this gives your blog a fresh new look, it is about much more than simply aesthetics! A blog redesign should improve the readability of your blog to increase the time your readers spend reading and the number of articles they are reading. It should also provide a better user experience by adding the ability to filter by interest or give personalized content suggestions based on past behavior. Of course, making it easy to share your articles on social media and comment on the blog post are also important features that should be part of any blog. A blog redesign can be done by purchasing a blog template (e.g., in the HubSpot Marketplace) and applying it yourself, by reserving a spot in our limited blog redesign initiative ($500), or by hiring a website design company to do a custom blog design (starting at $1,500). This will not only improve your organic traffic on existing blogs, but also increase conversions. Schedule a quick 30-minute call to discuss your blog optimization questions and goals! If you have plenty of traffic coming to your website but less than 1% of your visitors turn into leads, you have a conversion problem and a conversion optimization initiative is just what the doctor ordered. As part of this initiative, we would first do a thorough audit to determine what the problem is. This could be anything — you may not have enough call-to-actions placed in strategic places on your blog and website pages, or maybe the CTAs receive a lot of clicks but the landing pages don't convert. Once we have found the problem, we will present you a solution approach and, with your permission, go to work. It is important to understand that while our extensive experience and creativity are important, we will let data and analytics guide us by deploying heatmaps, A/B testing and much more. Depending on the size of your initiative, you can expect 30-60 days turn-around time. Considering a conversion optimization initiative that will pay for itself? Schedule a quick 30-minute call to get started. Almost every company is utilizing some sort of business blogging and content marketing as part of their marketing. But if everyone is doing the same thing, how can you cut through the noise? The secret is to create strategically-planned content that aligns with your business goals in so-called content clusters which in turn can be organized with or around a pillar page. A pillar is a single website page that covers a particular topic broadly, but comprehensively — with the intent to rank well in organic searches for a specific, high-volume search term. This can be either listing a massive list of resources, project ideas to inspire the reader, or cover a specific topic exhaustively. Go ahead and give it a try. 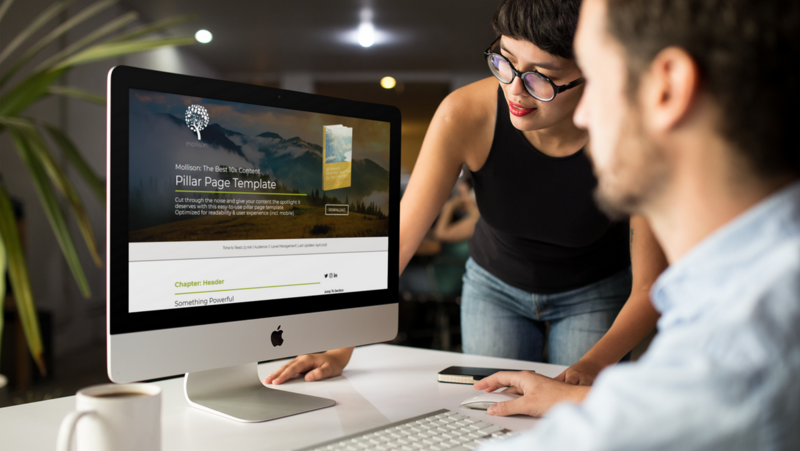 You can start by downloading our Mollison Pillar Page template. Don't have the time to do it yourself? Book a free Inbound Marketing Accelerator Session to get started. If done right, webinars can be a huge source of qualified leads! But organizing and promoting a webinar is hard work. No wonder that the average webinar, including the promotion, requires an investment of $1,000-$3,000. However, if you don't know what you are doing, wasting $3,000 isn't going to be your biggest problem. Because planning a successful webinar includes so many moving parts, important details are often overlooked. On the other hand, if you haven't done a webinar before, you might not realize the full scope of requirements until it's far too late in the process — leading to embarrassing blunders, like not connecting the webinar signups with your thank you page or forgetting to record the webinar! We have planned, promoted, and executed dozens of successful webinars and would be happy to help. For more information, please check out our First Webinar Project page. This approach is a great fit for companies with an in-house marketing team that is not well-versed in inbound marketing and have on-boarded with HubSpot or are about to. One of the most important things to know is that inbound marketing needs a solid strategy behind it. Without it, you are just producing a bunch of random blog posts and landing pages that do not re-enforce each other but simply co-exit. But creating a strategy takes time and marketers often find it hard to step out of their daily grind long enough to take a step back and view their organization from an outside-in perspective. And because creating an inbound marketing strategy while doing your everyday marketing activities that you already have is near impossible, we created a 30-day strategy assessment and game plan option for our customers. This is so important that we make this a mandatory requirement for each of our retainer customers. Even if you leave your marketing in-house, this option has several key benefits for you. You can leverage an experienced agency's experience and you buy your team time to train on HubSpot while we do the heavy lifting analyzing your business, buyer personas, competitors, etc. At the end of the month, your marketing team will walk away with an actionable detailed game plan for content, strategy and social media that will get them over the initial hump. The sales process has changed because the buying process has changed significantly in the past ten years. Today, a buyer takes 74% of his or her buyer's journey before ever talking to a salesperson, according to what Forrester found in a B2B study. Google confirmed the same was true for B2C. Even in the store, 82% of the shoppers user their smart phones to help them make product decisions, according to a Google/Ipsos Study. With most companies adopting Inbound Marketing as their primary way to generate leads, a tight alignment between sales and marketing is becoming vital to the success of the company. According to "The State of Inbound Marketing Report 2015" by HubSpot, companies who have a formal service level agreement between their sales and marketing teams have a 47% greater return on investment compared to last year, while only 3% saw a decline. Also, the companies with a formal SLA received higher budgets and were hiring larger sales teams as a result. One of the most effective ways to accomplish this is a company-wide marketing-sales workshop to bring everyone on board with inbound marketing. After this one-day seminar, sales and marketing will not only understand why they need to work together, but also how this will be accomplished. Everyone knows their roles and responsibilities and where to get support if needed. Get more out of your HubSpot investment by getting all of your employees quickly up and running by hosting a HubSpot Intensive Training Day for all marketing and sales employees. This is especially useful for companies who have invested in HubSpot in the past six months but have not seen a return on their investment because they cannot figure out how to put this rocket ship to work. Many companies are excited about the possibilities that come with all the opportunities HubSpot offers, such as automated workflows that nurture the generated leads or the campaign-wide analytics to see which campaigns have been performing well and which have not. But sometimes, after you have bought it and have gotten past the initial set up, the daily grind calls and the internal adoption and usage sort of tapers off as marketing personnel struggle to find time to get through the training. Well, this is your short-cut. Host an internal intensive training day and pack all the education that would take months to get through, in one day — and start 2019 with a supercharged marketing rocket ship and a crew that know how to use it! Is your sales team unhappy with the quality of leads they are receiving from you? Or is your website generating a lot of traffic, but not nearly as many leads as it should? Then it's time for a buyer persona workshop! Whenever the lead quality is off or you are just not getting enough submissions from your website, a thorough buyer persona workshop will help you identify your ideal customers, their characteristics and pain points, their objections and price points, as well as their preferred way to communicate. This will help you hone your messaging, better target your website content, and find blog post topics and lead magnets (premium content that is gated behind a landing page) that exactly match with what they are looking for. There is a revolution happening in the web design world. It's called "Growth-Driven Design" and your traditional web design company might not like it very much! The concept itself is nothing new: it applies the principles of lean software development to the web design process. You don't overhaul your website every three years anymore. Instead, you improve it incrementally with frequent small updates that are strategically planned and based on user testing and feedback. You start with what is called a launch pad website that will cover most of what you need right now. This is the basis upon which your web design team will make constant improvements. User Driven. In the traditional model, your website for the next three years is the best-educated guess of your web developer regarding what he or she thought was trendy or would perform best. But most of the time, there was little or no user testing done at all. With Growth-Driven Design, your launchpad website is developed based on first user testing and interviews, and then is improved based on the user's needs and the website's performance. Smoothing out the camel humps. With the traditional model, businesses would spend a significant chunk of money and 3-6 months developing this website that would sit around, just to repeat the cycle again in three years. With GDD, you continuously invest a smaller amount over time. A launchpad website can be up and running within 30-45 days.